My friends and I — poets and writers — are sending mixed signals: We love you. We shun you. We want to be in your pages, where the cool writers hang, laughing at inside jokes and rolling eyes at the hapless hopefuls. We pine for your validation, the stamp that says "real writer." Our desire is deep. Each year we send you hundreds of poems and stories. Please like me, we plead. Take my words — and for free! We want you that much. And just like high school, we quickly turn to envy, the sour face of adoration. We compare ourselves to other writers, and then, frustrated with our limitations, deride those we emulate. But here's the weird and creepy thing. Despite our desire, we don't really read you. Sure, we flip through your pages at AWP (the annual gathering of writers, this year a record 9,500 registered to attend). We'll smile and take free copies. We'll graze your website, but really, we're just looking for the submission guidelines. We want to be in your circle, but we don't really wanna hang out, don't wanna commit past the first date. No need to lock into something permanent like a subscription. Frankly, I don't know how you survive. With few of us reading, really reading, and even fewer paying our way, I'm not sure how you find the time, energy and financial means to produce the goods. And I'm confused. With nearly 3,000 -- that's not a typo, that's three thousand! 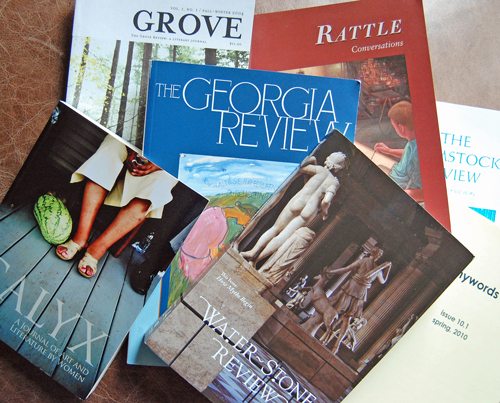 -- literary journals and magazines published in the U.S., it seems the industry is thriving (as evidenced here, and here). But with so few buying, you're widely unread. So, are you thriving or dying? Whatever the case, you press on. Cranking out issue after issue, a small fire of hope burns for donations, subscribers, a way to hang on. How do you do it? And how do we, as writers, want you but not support you? Love you but shun you? How does this circle keep turning?